Hi-P International saw the highest return of 49.2% YTD. 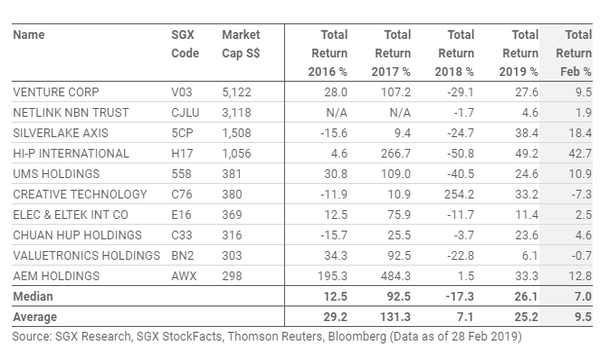 This chart from the Singapore Exchange (SGX) shows that the top 10 largest capitalised tech stocks saw average total returns of 25.2% in February YTD. On an MoM basis, the stocks hit average returns of 9.5%. Amongst the top 10 tech stocks, telco manufacturer Hi-P International saw the highest return of 49.2% YTD and 42.7% MoM. This was followed by Silverlake Axis (38.4% YTD), AEM Holdings (33.3%), and Venture (27.6%). SGX also noted that nine of the 10 stocks saw an increase in average daily trading values in February, compared to the preceding three months, with the largest relative increases in traded value generated by Hi-P, Valuetronics Holdings and Silverlake. Combined, the total trading turnover for the 10 stocks soared 51% to an average of $68.1m a day in February, from $45m a day for the preceding three months. Moreover, the majority of the 10 stocks were also subject to net institutional inflow in February, and were led by $16m of net institutional inflow to Hi-P, SGX added. 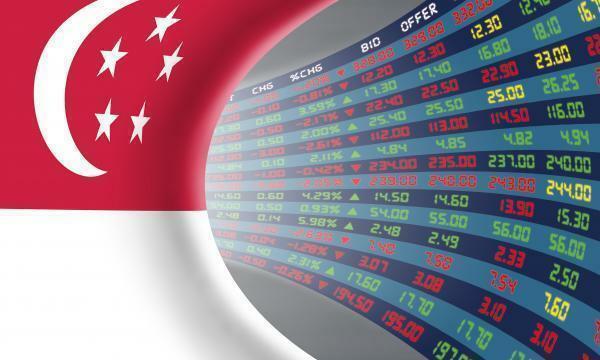 Together, the top 10 tech stocks have a combined market capitalisation of $12.9b, SGX noted.